Planning the new upcoming dance season is SO exciting! 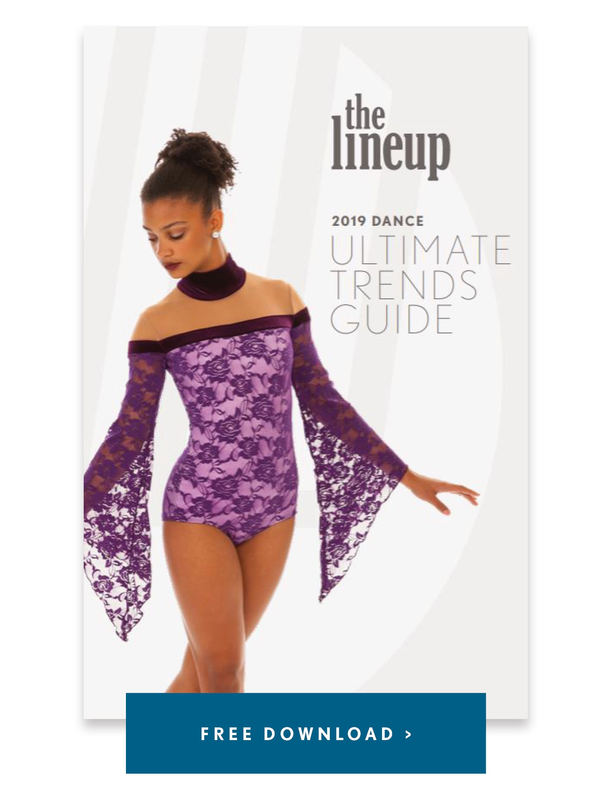 Many times this means designing a new costume, which means a design consultation with your dance costume design company. You will likely be getting a lot of information out of this design consultation- but how can you prepare beforehand? Find out here! 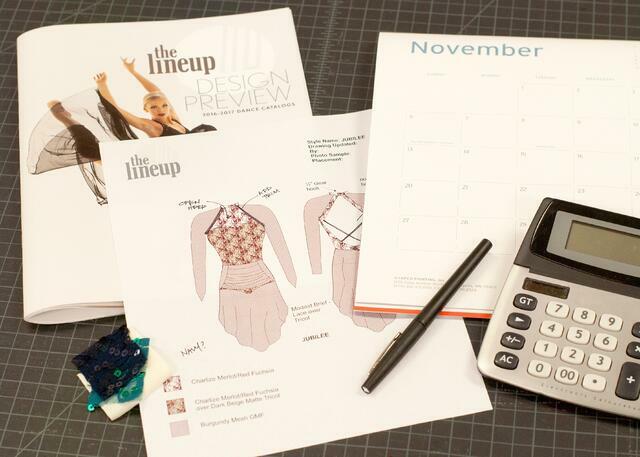 Clarify your design ideas and explain your performance goals to the dance costume design team. Identify design options that meet your performance goals and budget. This includes the overall look, fabrics, colors and more! Establish the process, steps and a time table for completing the project to ensure on time delivery for your performance. To get the most out of the meeting with your team, it is important to come well prepared. This will save time and allow you to make decisions quickly. Determine Your Decision Makers and Limit the Number of People Involved. Your decision maker is the person that ultimately pulls the performance together. They not only determine the new costume design, they also decide the music, choreography, and select the team. This person needs to be involved from the beginning! It is usually the Coach, and/or the Assistant Coach. So, who else and how many people should be in the meeting? Bring only 1-3 people from your team to the design consultation. Too many opinions result in indecision and confusion for everyone! When there are too many voices, you risk confusing the designer and he/she will not know who to listen to! Include whoever has the creative vision for your costume as well! This is the person that has ideas about the overall design and look of the costume like style, aesthetics and color. Often input from your captains is important, you want them to feel comfortable and confident in their dance costume! However, if including them in the meeting pushes the participants to over 3, solicit their input before and after the meeting. The design experts are a must. They are the people that make your ideas happen! This generally includes the person that manages your account and the dance costume designer. Provide your design team with realistic guidelines by being upfront about and knowing your budget before the design consultation. Your designers would never want to design something you love but can't afford! They want to design within your budget. Designing a look for you can take the designer several hours. Knowing what is feasible gets you to a "solve" faster and saves time and confusion for you and the design team in the long run. Be clear about what is most important. Is it budget or design integrity? If it is design integrity, what is your limit on the budget? Base your budget for this year's costumes off of last years. This is generally accurate enough to move forward on new designs, provided you plan on staying within that same budget range. If your members will be paying for their own costumes, ask them what they're comfortable with paying before the meeting. A ballpark budget range is better than nothing at all! Designing from Scratch: If you want a unique look of your own, prepare for a lead time of at least 12-16 weeks. Your designers need time to provide solutions to your design needs, draw up a design, create a prototype, and make any final edits before it's officially in your hands. You want to have enough time to make adjustments, if needed. Working on a Tight Time Frame: If you have a time frame of less than 10 weeks, be prepared that your design options may be more limited. An experienced costume designer will be able to work with you to find the solutions that will save time, such as using an existing pattern or modifying a style that is sure to work for you. Some costume companies offer products that can be customized on their store, or from a set assortment of styles. A good designer will come up with something that can be customized easily, while still achieving the look that you want! West Michigan Dance Team in their custom designs. Generally, price is influenced by quantity. With most custom designers, the more you order the less it costs per costume. Take advantage of discounts and know how it will affect the price before you begin designing. Usually, the design process begins before your whole team is put together, so an estimate of your quantity for the discount is totally fine! A general idea of your size range is also helpful. If you know you'll be needing child and adult sizes, or if you have any special fit sizes you know about beforehand, knowing these measurements early on is helpful for the design process. Plenty of teams overestimate and order extra costumes, too! You can never be too prepared. If you think you will need extra costumes for upcoming years, consider this before the design meeting and it will save you money later! Most Important: Bring Your Inspiration and Questions! Never come to a design consultation meeting without ideas. The costume designer is not always able to come up with something for you, and this can make the process frustrating for both the designer and you. The best dance costume designers are those that ask questions and are able to extract your inspiration from you by asking thought provoking questions. A good designer will be able to know just what you're thinking- but they do need something to work off of! So, be sure to have your ideas well thought out, and bring your inspiration with you to support it. Your theme or concept will give more focus to your costume design. It doesn't always have to be a theme, like "50s Retro," for your designers to get started. Sometimes having a general concept like "edgy" or "romantic," is plenty to get yourself and the designers on the right path! Bring any and all of your inspiration pictures. Your design team will go through what you like and don't like about each picture. Whether your pictures are color influenced, or "feel" influenced, it's all useful to the design team. Pinterestis a great place to start gathering ideas! Your music and choreography ideas will also help the design process. Have your designer experience the feel of the music so they can clarify the look and feel of the costume. You can't perform a "flowy" performance to a romantic song in a stiff skirt! Your designer will know this and come up with a concept that will best fit your routine ideas. Narrow your ideas down to 1-2 options before the meeting. For example, chose two color schemes and two style options. More than that, and it can cause confusion and waste time for the designer. Bring your questions! A design consultation meeting is likely the only time you have to sit down directly with your designers, so it's a great opportunity to ask questions about fabric and fit that account managers may not know the answers to. 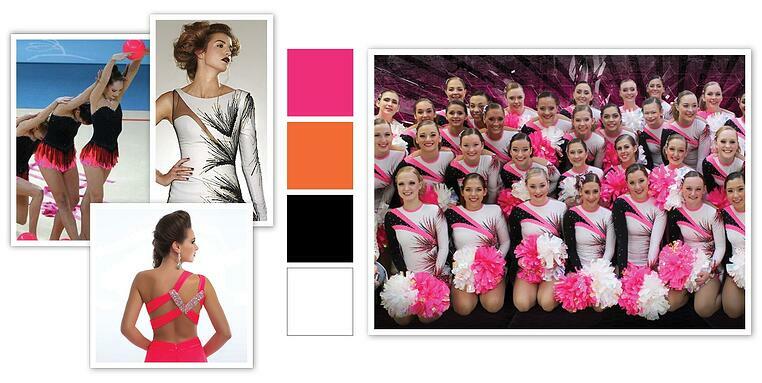 Green Bay Southwest Troyettes 2015 dance costume and inspiration pictures and color schemes. 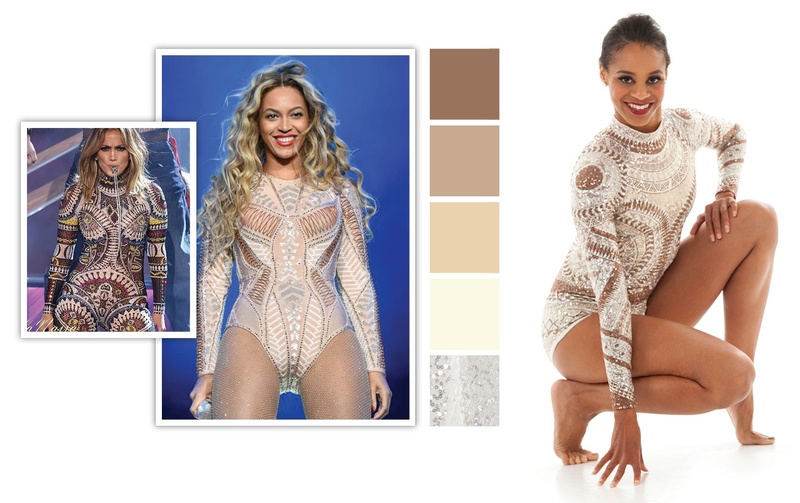 An example of inspiration pictures and color schemes, used to create our Champagne Leotard! You may feel like you have a lot to prepare for before your design consultation, however; your time will be well spent to make sure the project stays on track, is designed correctly, and that your team has an OUTSTANDING performance! 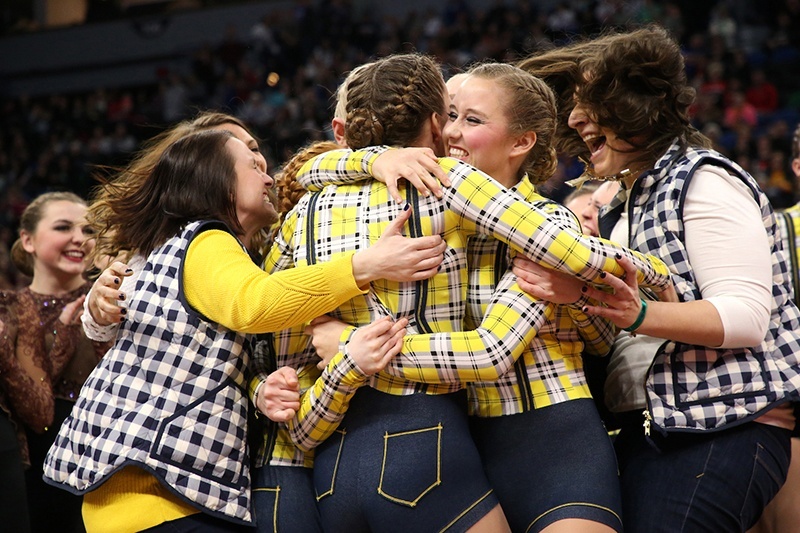 Remember, you're not only creating a great costume, but lifelong memories for your team. Want to get started? Download your free copy of our Imagination Kit, and schedule your design consultation! How Long Does it Take to Get a Custom Dance Costume? How to Design a Custom Dance Costume: What’s a Prototype or Sample Garment?